When wort is too cold, you get long lag times and increased opportunities for bacterial infection. When it’s too hot, off-flavors can form. Blichmann Engineering’s patented ThruMometer™ lets you get it just right – letting you adjust wort and water flow rates in your counterflow heat exchanger to dial in an exact temperature, with no more guesswork! fits our 1/2″ ID silicone tubing. Plus, use only the water you need – good for the environment and your wallet! 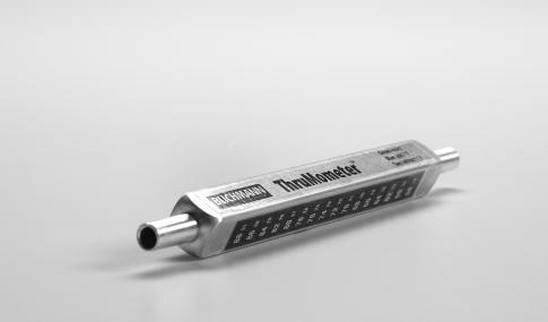 While traditional in-line thermometers are made from a complicated assembly of pipe fittings with numerous places for bacteria to build up, the ThruMometer’s™ entire interior is mirror-smooth, offering bacteria no place to hide. Plus, its non-serrated barbs are much easier to clean and use— thus neither harboring bacteria nor damaging hoses. Press-fit ends are machined to 0.005″ precision and finely finished to allow our 1/2″ ID hose to snugly and securely fit over the barb.